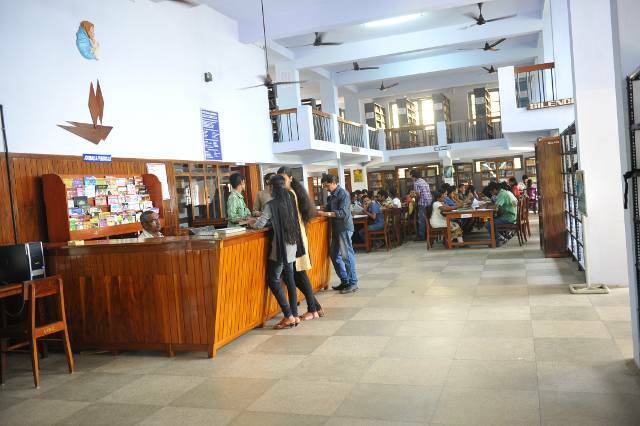 St. Xavier's college Library was established in 1964 together with the establishment of the college. Library in the name of Jesuit Malayalam poet Arnos Padiri runs in a spacious building which has a carpet space of 7093 sq.ft. and a capacity to house 250 members. Library has stack area in mezzanine floor and and reading/reference area in the ground floor. The Library provides print and electronic resources for all academic and related activities of the students and staff. The library has a collection of 28,074 books and 47 journals/magazines. Over 161 Educational CDs on different subjects are available for the use of stakeholders. Library is fully automated with LIBSOFT software and OPAC facility. Books available for circulation are listed in OPAC. Information about status (such as issued, binding and withdrawn) of books is also available through OPAC. Library htaffic is monitored by an automated gate register software. 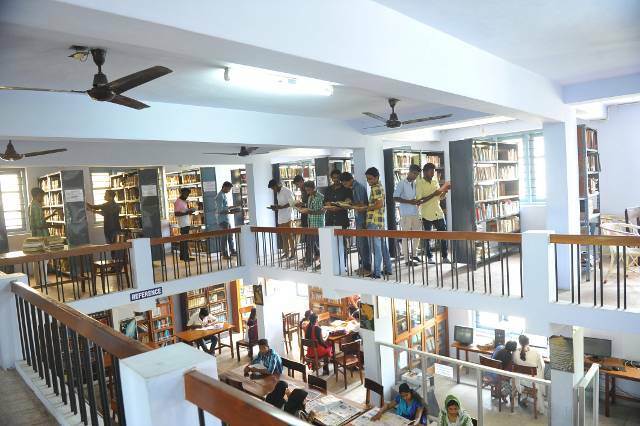 College also houses department libraries under various departments in coordination with the main library. Users can also avail the well equipped e-resources provided under the N-LIST of the INFLIBNET project and National Digital Library Initiative. User ID's and passwords are issued to the members for the free access to these resources. It facilitates to gather information from e-journals, e-books. Admission to the library is restricted to members only. Before entering the Library the members should mark their entry by scanning their ID card to the automated gate register scanner. Private books and personal belongings are to be deposited at the Property Counter. Students are allowed to take only writing paper and a pen with them in the reading and reference sections. All staff members and students may get their user ID and password for accessing e-resources from the website: www.nlist,inflibnet.ac.in on submission of email ID to the librarian. Silence must be observed inside the library and loud talking is prohibited in all parts of the library. Use of Mobile Phone inside the Library is not permitted. Books should be handled with care. Writing on books is most objectionable and may lead to penalties as may seem fit. In all matters regarding the library, decision of Principal will be final. Books on loan can be recalled at any time irrespective of the period of loan at the discretion of the Librarian and non compliance may lead to the cancellation of membership. Loan can be renewed for a further period of seven days if the books are not required by others, but not more than two consecutive renewals are permitted for students. Issue register for staff and students are separately maintained in the Circulation Counter where members can personally note down their Membership Number and due date/s of the book/s issued. Loan period will not be renewed for books for which reservation for borrowing is received. Before leaving the counter the member must satisfy himself as to whether the books lent to him/her are in sound condition and if not, he/she must immediately bring the matter to the notice of the assistant on duty at the counter. Otherwise he/she shall be held responsible for any damage discovered afterward. Damage or loss of books on loan should be immediately reported to the Librarian. Members are liable to replace such books or pay the damage/ cost of the book as fixed by the Librarian. If one volume of a set is damaged or lost the whole set may be required to be replaced. No book will be issued to such members till the loss has been made good. They are liable to pay overdue charges as per Rule 5(ii) in addition to the cost of the book upto the date on which the loss was reported. If the book reported as lost is later found out and returned then overdue charges will be levied from the due date. Before taking any book or journal for photocopying, permission must be obtained from the library staff on duty. Students will get a library membership form at the time of their admission, which will authorize them to access the facilities of the library till the end of their course. Membership is not transferable and is a privilege which only the member is entitled to. Sub-lending of books is a misuse of this privilege and is to be avoided. Circulation is regulated through an automated system under LIBSOFT software. Members have to return all books and clear all dues, before they register for the last semester university examinations or are issued Transfer Certificate whichever is earlier. The staff working in the college shall also obtain clearance certificate before leaving the college or retirement.